Acidity Fighter: Ginger is better than any over-the-counter medication available for acidity. Chewing on a piece of ginger or drinking ginger tea will stimulate the production of saliva in the mouth which helps neutralize the acids that have refluxed into the esophagus. Keeps Ovarian Cancer at Bay: Ginger is found to have the ability to kill the growth of cancerous cells in the ovaries. So, its therapeutic utility is established in the treatment of ovarian cancer too. Fights Nausea: If nausea is bugging you continuously, simply chew on a small piece of ginger. It promotes the production of digestive juices and enzymes that neutralize stomach acids. Alleviates Pain: Ginger is a natural anti-inflammatory agent. It affects various inflammatory processes at the cellular level and is a low-level analgesic. It also reduces joint pain and stiffness, especially in arthritic patients. 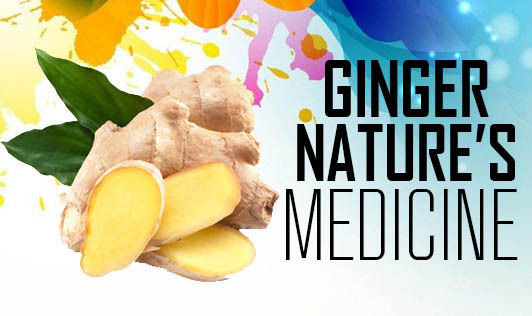 Ginger offers innumerable health benefits and is one of the best natural medicines available in your kitchen. Try and incorporate at least a slice of this root to your daily diet and you will begin to feel the difference.